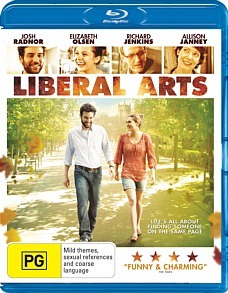 Liberal Arts Blu-ray Review This is one movie I really wanted to walk out on yet little things like Efron made me stay. Jesse Fisher (Josh Radnor) is invited to see his old college professor, Peter Hoberg (Richard Jenkins) retire and give his closing speech at Liberal Arts College. While at the retirement party he meets the beautiful, young, Zibby (Elizabeth Olsen). The pair immediately hit it off but while their passion continues to blossom it becomes evident that the distance and age between them could make or break the couple. Where to start, first off this movie is directed by Josh Radnor, it’s also written by Josh Radnor, produced by Josh Radnor and starring, yep you guessed it, Josh Radnor. Just like Inception it’s a Radnor within a Radnor and that’s my main issue with Liberal Arts: it’s just so self-indulgent. Radnor, the rad for short, is so assured of himself in real life that he just comes off a little too conceded. The dialogue is unrealistic between Radnor and Olsen. She is a college student not a professor with a degree in the English language. Liberal Arts doesn’t play out like your usual 3 act movie either. While there might be a setup, there is no conflict or resolution. The script lacked plot devices that make a movie convincing. I found my attention being drawn to Hoberg (Jenkins). His storyline of the retired professor trying to find meaning to his life and make the last days of his life count, just made more sense of a movie then the escapade that Jesse takes. I hate getting film critic in my reviews, I like to talk to the reader like they are my friend but Josh Radnor doesn’t seem to know how to direct a movie either. I found myself being shocked when he would break first rules of angles, choosing quantity over quality. There were numerous times that extras were in scene after scene where it would have been physically impossible for them to have made that distance in so little time. Liberal Arts is filled with edits that didn’t seem to connect up to the script taking me completely out of the movie and making me think what the heck just happened. I can understand that this is his second movie, but I would had hoped that he would have had lessons in the art before using his fame to make movies. While it is almost a complete failure in my eyes there was a glimmer of hope in the extended cameo of Zack Efron as the hippy stoner Nat. Efron’s acting lit up the audience, bringing me out of my daze and throwing in a couple of chuckles. Yet again I found myself more intrigued in to what his character was up to, even if his screen time was no longer than 5 minutes. It can’t be a good thing when you write a movie and accidently make the supporting cast is more entertaining than the main storyline. Is it possible that Josh Radnor is a genius and committed the crime on purpose? I doubt it! Liberal Arts comes off as an indie movie trying too hard to be an indie movie. Making it too quirky and unique just made it more weird and unoriginal. This is one movie I really wanted to walk out on yet little things like Efron made me stay.